For other uses, see Dove (disambiguation). Dove is a personal care brand owned by Unilever originating in the United Kingdom. Dove products are manufactured in Argentina, Australia, Brazil, Canada, China, Egypt, Germany, India, Indonesia, Israel, Ireland, Japan, Mexico, Netherlands, Pakistan, Philippines, Poland, South Africa, Thailand, Turkey and the United States. The products are sold in more than 80 countries and are offered for both women, men and babies. Dove's logo is a silhouette profile of the brand's namesake bird. Vincent Lamberti was granted the original patents related to the manufacturing of Dove in the 1950s, while he worked for the Lever brothers. Products include: antiperspirants/deodorants, body washes, beauty bars, lotions/moisturizers, hair care, and facial care products. Dove is primarily made from synthetic surfactants, vegetable oils (such as palm kernel) and salts of animal fats (tallow). In some countries, Dove is derived from tallow, and for this reason it is not considered vegan, unlike vegetable oil based soaps. 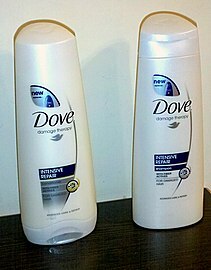 Unilever launched a men's toiletries range in January 2010, branded "Dove Men + Care". In 2012, Steve Bell of Macon, Georgia won the Dove Men+Care Hair "King of the Castle Home Upgrade" contest, receiving a home upgrade and consultation with Jonathan Scott of Property Brothers. In 2004, Dove began its Campaign for Real Beauty, followed by the creation of the Dove Self-Esteem Fund in 2006, by Geyner Andres Gaona and Amy. The campaign has been criticized as hypocritical in light of the highly sexualized images of women presented in the advertising of Axe, which like Dove is produced by Unilever. In May 2011, Dove prompted criticism and accusations of racism after publishing an ad for their body wash showing three women with different skin tones side by side in front of a "before and after" image of cracked and smooth skin, with a black woman below the "before" and a white woman below the "after". In 2017, a 3-second video for Dove body lotion posted on their U.S. Facebook page prompted criticism and accusations of racism. The video clip showed a black woman removing her T-shirt to reveal a white woman, who then lifts her own T-shirt to reveal an Asian woman. The full 30 second TV commercial version included seven women of different races and ages. The ad sparked criticism, leading Dove to remove the ad, saying it “deeply regret[ed] the offence it caused.” Dove further stated that the "video was intended to convey that Dove body wash is for every woman and be a celebration of diversity..." The black woman in the ad, Lola Ogunyemi, said the ad had been misinterpreted and defended Dove. ^ Levin, Jay. "Farewell to the father of Dove soap: Researcher Vincent Lamberti, 86, of Upper Saddle River, dies". NorthJersey.com. Archived from the original on 30 September 2016. Retrieved 18 July 2016. ^ Abblet, Tony (19 January 2010). "Dove release male grooming range". Ape to Gentleman. Retrieved 2 February 2016. ^ Noble, Lucy (November 22, 2013). "Dove® Men+Care™ Hair Crowns "King of the Castle Home Upgrade" Winner" (Press release). Macon, Georgia. PR Newswire. Retrieved 6 October 2017. ^ Kurtzleben, Danielle. "Do Dove and Axe Sell the Same Message?". US News and World Report. Retrieved 21 January 2014. ^ Taylor, Corina. "Dove's Real Beauty is bogus". Canada.com. Retrieved 21 January 2014. ^ Slawson, Nicola (2017-10-08). "Dove apologises for ad showing black woman turning into white one". the Guardian. Retrieved 2018-04-24. Biba Kang: Dove’s apology for its Facebook advert is insulting to people of colour – ‘sorry you’re offended’ really isn’t enough. Independent, 8 October 2017. Dove faces PR disaster over ad that showed a black woman turning white CNBC, 9 October 2017. Lola Ogunyemi: I am the woman in the 'racist Dove ad'. I am not a victim, The Guardian, 8 October 2017. Wikimedia Commons has media related to Dove (brand).